Jewish Senator blasts as "absurd" reintroduction of bill protecting states passing anti-BDS laws. 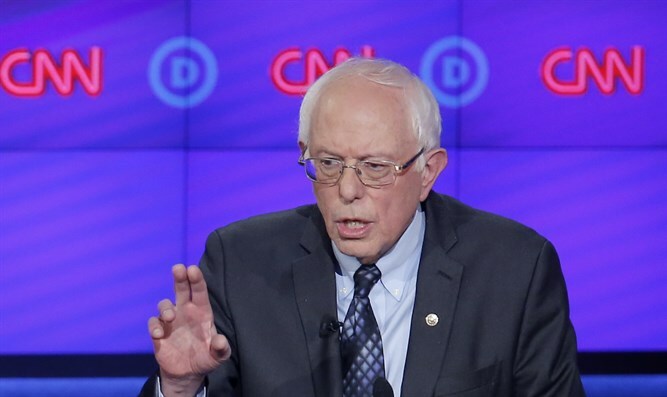 Senator Bernie Sanders (I-VT) on Sunday blasted the reintroduction of a bill that would establish federal legal protections for states passing laws divesting pension funds from groups that boycott Israel, JTA reports. On Friday, Senator Marco Rubio (R-FL) reintroduced pro-Israel legislation that did not get passed in the last Congress. In addition to the anti-BDS bill, Rubio also reintroduced a bill that would codify the 2016 memorandum of understanding between the Obama administration and the Netanyahu government that guarantees Israel $38 billion in security assistance over 10 years. “It’s absurd that the first bill during the shutdown is legislation which punishes Americans who exercise their constitutional right to engage in political activity,” Sanders wrote on Twitter. A number of Democrats shied away from that bill, citing free speech concerns. Sanders was one of these senators, as was Senator Dianne Feinstein (D-CA). Sanders, an Independent who caucuses with Democrats, mounted a surprisingly strong challenge in the 2016 Democratic presidential primaries against Hillary Clinton, and has hinted he may run again in 2020. While Sanders is Jewish and spent time in a kibbutz when he was young, he has a history of problematic statements on Israel. Last April, Sanders criticized Prime Minister Binyamin Netanyahu and his policies, saying, "As someone who believes absolutely and unequivocally in Israel's right to exist... we must say loudly and clearly, that to oppose the reactionary policies of Prime Minister Netanyahu does not make us anti-Israel."